In many ways, social media combines the best of classic ideas with new tools. 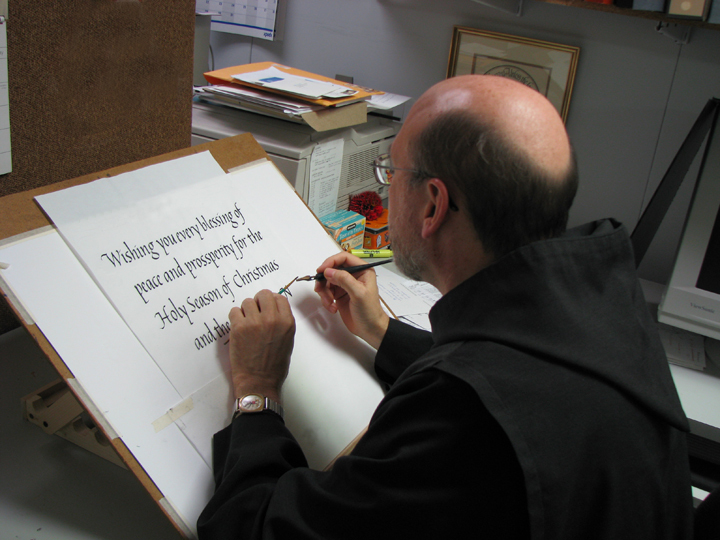 This week we look at an example from The Printery House, an apostolic work of the monks of Conception Abbey, a Benedictine monastery set in the rolling hills of northwest Missouri. Cards created on-site and a variety of religious gift items help share the gospel mission of The Printery House. In contrast to lightning-fast texts and Skype messaging, The Printery House is promoting something over social media you just can’t replace: a handwritten message of hope or encouragement. Audience members are encouraged to use social media to share experiences they’ve had with cards or to talk about ways they celebrate special moments with friends and family. They can connect with the monks and artists through pictures of them working behind the scenes, or by a regular email newsletter. These efforts and a catalog publication help build an audience around the nation for The Printery House cards and gifts. Recently a new promotion is drawing attention to the ways this 60-year-old business continues to encourage and inspire with the written word. Called Cards For Caleb, The Printery House is asking its audience to send a card to Caleb Adwell, a teen from northwest Missouri who is battling a rare type of cancer. The goal is to flood Caleb’s mailbox with cards from all over, hoping to bring a smile to his face to let him know so many thoughts and prayers are with him as he continues to fight the disease. The Printery House plans to promote a “Card Party” event regularly to those needing encouragement, which we think is an outstanding way to meld the classic traditions of greeting cards with modern online tools. Today, we invite you to “Send something you believe in” to Caleb: a cheerful card made by the monks and artists at The Printery House. Every card is designed and printed on-site, and every card makes a difference. Now that’s a valuable Monday morning activity. This entry was posted in Monday Morning Coffee and tagged blog, build brand value, coffee talk, copywriting solutions, engage customers, Facebook, social media strategy. Bookmark the permalink.